Shari Lebowitz easily recalls the stationery that gave flight to the many notes she wrote from her tweens to her college years. After becoming an interior designer, she became known for giving her clients custom-made stationery once the project was complete. These days, this self-described “paperpreneur” still helps clients pick out colors, patterns, textures and designs, but it is as founder and owner of Bespoke Designs, a fine stationery, couture invitation and gift store in Westport. She opened it a year ago, after moving there from Manhattan. The store arrived amid rising interest in customized and couture stationery that makes a statement even before any words are written. “Good Fortune” is one of Bell’Invito’s designs sold at Bespoke Designs stationers in Westport. For those who feared the art of the handwritten note was slipping away with all those fingers tapping out missives on keyboards and touch screens, the last dozen years or so has brought comfort. Even as sales of more pedestrian stationery (office paper, folders) slows, these niche, high-end products have made a comeback. It began with the rise of small letterpress shops that reclaimed the centuries-old art of pressing paper into metal type. Next came younger consumers — perhaps the same nostalgic block who had reached for vinyl records and fedoras — who wanted unique greeting cards and beautiful day planners. An old-time craft may have returned, but the aesthetic is modern, fresh and bold, full of contemporary wit and humor. It offers fans a chance to differentiate themselves in a digital world that has increasingly become glutted with images — many easily reproducible, unoriginal and shared. A deco-style sailboat by Bell’Invito is a stationery style available at Bespoke Designs in Westport. “That is what makes paper all the more special when it is used,” says Heather Wiese Alexander, owner of Bell’Invito stationers, which opened about 15 years ago. Known for its personalized invitations and couture stationery, it has embraced old-world craftsmanship and modern techniques to offer letterpress, engraved and foil products. Bespoke Designs is one of eight shops around the country that carry the line. 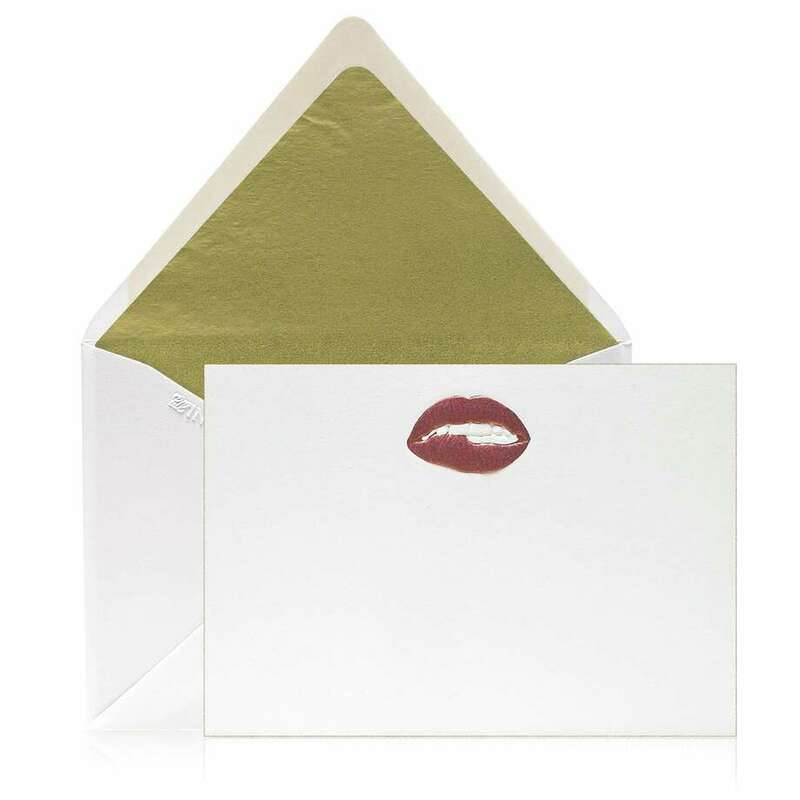 “Pucker” is a popular stationery design in the Bell’Invito line. That may mean the French chateau where you are getting married becomes part of the design of your wedding invitation suite, or a beloved painting your daughter made at age 6 is an integral part of her sweet 16 invitation. These are all projects Lebowitz has worked on in the past year. Whether the visual inspiration arrives in hand, or customers are moved by the images and invitations pinned to the shop’s walls, Lebowitz wants to create something that is unique to that client — not unlike the interiors she once designed.